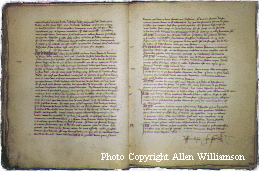 Above: photo of the copy of this letter (left-hand page and top of right-hand) entered into ms 1119 (reproduction). It was then sent to the English when she was at the town of Blois (c. April 22-25). Although the version of this letter that was entered into the Condemnation transcript is often used, there are a number of versions in various documents which, as usual with such copies, differ to varying degrees. These can be grouped into two main variations, for which a representative example of each is given below; there is also a version which treats the document as four separate letters (one addressed to the King, one to the Duke of Bedford, one to the other English commanders, and one to the English soldiers), which is additionally included below for comparison. It needs to be noted that Joan denied having dictated three phrases in the letter when the issue came up during the questioning: the phrases "rendez à la Pucelle", "corps pour corps" and "chief de guerre".1 I have therefore marked these in italics to show that they are erroneous (although they also appear in the other versions; apparently the scribe who recorded the letter added these on his own initiative). The scribe may also have been responsible for the use of the third person voice. Joan confirmed the substance of the contents. For each of the three versions which are presented below as representative examples, an English translation is on the left, notes and commentary on the right. A transcription of the original language is also available. King of England,n2 and you, Duke of Bedford, who call yourself Regent of the Kingdom of France; you, William de la Pole, Earl of Suffolk; John, Lord of Talbot; and you, Thomas, Lord Scales, who call yourselves Bedford's lieutenants,n3 do right by the King of Heaven.n4 Hand over to the Maiden,n5 who is sent here by God the King of Heaven, the keys to all the towns which you have taken and violated in France. She has come here in the name of God to support the Royal family. She is quite prepared to make peace, if you are willing to do right, so long as you give up France3 and make amends for occupying it. And you, archers, soldiers both noble and otherwise,n6 who are around the town of Orléans, in God's name go back to your own lands. And if you will not do so, await word of the Maiden, who will go to see you soon to your very great misfortune. King of England, if you do not do so, I am a commander, and wherever I come across your troops in France, I shall make them go, whether willingly or unwillingly; and if they will not obey, I will have them wiped out.n7 I am sent here by God the King of Heaven - an eye for an eyen8 - to drive you entirely out of France. And if they are willing to obey, I shall have mercy on them. And do not think otherwise, for you will never hold the kingdom of France from God the King of Heaven, the Son of Saint Mary;n9 King Charles, the true heir, will hold it, for God the King of Heaven wills it; and this has been revealed by the Maiden to him [i.e., Charles], who shall enter Paris with a fine contingent of troops. If you do not believe the tidings sent by God and the Maiden, wherever we find you we will strike against you, and will cause such a great clash of arms there that not for a thousand years has France seen one as great,n10 if you do not do right. And firmly believe that the King of Heaven will send greater force to the Maiden than you would be able to bring against her and her good men-at-arms in all of your assaults. And in the fighting we shall see who has the better rightn11 [whether God of Heaven or you].4 Duke of Bedford, the Maiden asks and requests that you will not cause your own downfall. If you will do right, you could yet come in her company to where the French will do the noblest deed which has ever been done for Christianity.n12 And reply if you wish to make peace in the city of Orléans; and if you do not do so, you will shortly contemplate your great misfortunes." Note 1: "Jesus, Mary" was a standard 'slogan' used by her, appearing on her battle flag, two of her rings, and most of her letters. Note 2: Written in large lettering in this copy. The child-king Henry VI (seven years old in March 1429) is of course being included here merely as a common formality, along with his regent, Duke John of Bedford. Note 3: Suffolk, Talbot (the Earl of Shrewsbury), and Scales were among the English commanders at Orléans. Note 4: This was a common phrase she used, sometimes expressed as "King Jesus, King of Heaven" (as in her letter on 17 July 1429), or more indirectly as the "Son of Saint Mary" below. Note 5: She said this should be "to the king" rather than "to the maiden". "La Pucelle" - "the maiden" or "virgin" - was her standard 'nickname', which she explained by saying that she had promised her saints to remain virgin "for as long as it pleases God". She was later canonized by the Church as a "Holy Maiden". Or "soldiers, nobles..." The breakpoint between phrases is not clear in the original manuscript. "Make them depart" is the version given at this point in many of the other copies,5 although most of these have a similar phrase at a different place in the text. Or more directly, "life for life" - "corps pour corps" was often used in the sense of "one life for another", and is used as such in the French translation of the famous Biblical passage: "a life for a life, an eye for an eye, a tooth for a tooth..."
I.e., Jesus, Son of the Virgin Mary; the latter being called "Mother of God" in Catholic theology, in reference to Christ's status as God Incarnate. This is why Joan of Arc used "Jesus" and "God" interchangeably, referring to both as the "King of Heaven". "Droit" - hereditary right (to the throne of France), the cause over which the Hundred Years War was fought. This is believed to refer to the planned crusade against the Hussites which she mentions in a later letter sending an ultimatum to the Hussites themselves.7 Other versions of the letter imply that if Bedford doesn't act rightly, then the French will perform the finest deed for Christianity in a fight against him. "Holy Week" is the period preceding Easter. Version in "Journal du Siège d'Orléans"
King of England,n2 do right by the King of Heavenn3 concerning His Royal line; hand over to the Maidenn4 the keys to all the towns which you have taken. She has come on behalf of God to support the Royal family, and is quite ready to make peace, if you are willing to do right, so long as you give up France,9 and make amends for occupying it. King of England, if you do not do so, I am a commander: wherever I come across your troops in France, if they are not willing to obey I shall make them leave, willing or not. And if they are willing to obey, I will have mercy upon them. Know that if they will not obey, the Maiden is coming to wipe them out. She comes on behalf of the King of Heaven - an eye for an eyen5 - to drive you out of France. And the Maiden promises and guarantees that she will cause such a great clash of arms there that not for a thousand years has another one so great been seen in France,n6 if you do not do right. And believe firmly that the King of Heaven will send more force to her and her good men-at-arms than you would be able to have in a hundred assaults. You, archers, soldiers, who are around Orléans, go back to your own land, in God's name. And if you do not do so, watch for the Maiden, and you will shortly contemplate your misfortunes. Do not think otherwise, for you will never hold France from the King of Heaven, from the Son of Saint Mary;n7 but rather it will be held by King Charles, the true heir, to whom God has given it, who will enter Paris with a fine contingent of troops. If you do not believe the tidings from God and the Maiden, wherever we find you we will strike against you harshly, and you will see who will have the better right,n8 God or you. William de la Pole, Earl of Suffolk; John, Lord of Talbot; Thomas, Lord Scales, lieutenant of the Duke of Bedford, self-styled Regent of the Kingdom of France for the King of England; reply if you want to make peace or not at the city of Orléans. If you do not do so, then you will contemplate your misfortunes. Written this Tuesday in Holy Week. Heed the tidingsn10 from God and the Maiden. To the Duke of Bedford, who calls himself Regent of the Kingdom of France for the King of England. Note 1: A standard 'slogan' she used. See comments under "Note 1" for the above version. Note 2: See comments under "Note 2" for the above version. Note 3: A common phrase she used (sometimes as "Jesus, King of Heaven"). See comments under "Note 4" for the above version. Note 4: Or "virgin"; her standard 'nickname' since, as she said, she had consecrated her virginity to God. See comments under "Note 5" for the above version. See comments under "Note 8" for the above version. See comments under "Note 10" for the above version. I.e., Jesus, Son of the Virgin Mary; see comments under "Note 9" for the above version. "Droit", here being used as a more indirect reference to the hereditary right to the throne which was at the heart of the war's underlying dispute. In this version of the comment, she threatens to fight something akin to a crusade against Bedford. See comments under "Note 12" for the above version. The version in Thomassin's 'Registre Delphinal' gives "Entendez les merveilles" ['Await the miracles...'] rather than "Entendez les nouvelles" ['Heed the tidings']. King of England,n2 do right by the King of Heaven concerning His Royal line. Hand over to the Maidenn3 the keys to all the towns in France which you have taken. She has come on behalf of God to support the Royal family, and is quite ready to make peace, if you are willing to do right, so long as you give up France, and make amends for occupying it. And if you do not do so, I am a commander; wherever I come across your troops in France, if they are not willing to obey I shall make them leave, willing or not; and if they are willing to obey, I will have mercy upon them. She comes on behalf of the King of Heaven - an eye for an eyen4 - to drive you out of France. And the Maiden promises and guarantees that she will cause such a great clash of arms that not for a thousand years has there been another one so great in France.n5 If you do not do right, believe firmly that the King of Heaven will send her more force than you will be able to bring to bear against her and her good men-at-arms. You others, archers, aristocratic and valiantn6 soldiers who are around Orléans, go back to your own land, in God's name. And if you do not do so, watch for the Maiden, and you will shortly contemplate your misfortunes. Do not think otherwise, for you will never hold France, which belongs to the King of Heaven, the Son of Saint Mary; but rather the noble Charles will hold it. If you do not believe the tidings from God and the Maiden, wherever we find you we will strike against you harshly, and we will see who will have the better right,n7 God or you. William de la Pole, Earl of Suffolk; John, Lord of Talbot; and you, Thomas, Lord Scales,n8 lieutenants of the Duke of Bedford, self-styled Regent of France for the King of England; reply if you want to make peace at the city of Orléans; and if you do not do so, you will contemplate your misfortunes. Other versions give "Entendez les nouvelles" ['Heed the tidings']. See comments under "Note 2" for the first version. Or "virgin"; her standard 'nickname' since, as she said, she had consecrated her virginity to God. See comments under "Note 5" for the first version. See comments under "Note 8" for the first version. See comments under "Note 10" for the first version. See comments under "Note 8" for the second version. These were English commanders at Orléans; see comments under "Note 3" for the first version. See comments under "Note 9" for the second version. Translation and other content Copyright © 2005, Allen Williamson. All rights reserved.